It will be with a goal deficit that Manchester United travel to Barcelona next week hoping to overturn a first-leg defeat in their Champions League quarter final. In a game of few clear chances, it was an own goal that won it for Ernesto Valverde’s team and it came in the first 15 minutes. United struggled to get going, the few chances they created were forced and not one was on target. This was far from a lesson from Barcelona who passed and moved from what seemed like dawn to dusk but there were periods of sloppiness and never the urgency nor hunger to put the tie to bed. In some ways, the home side were let off and the tight, cagey nature of the match possibly suited Ole Gunnar Solskjaer’s team. However, at the Camp Nou in six days time, things will be different and United will go there behind but still in it. Solskjaer wanted his side to be resilient more than anything else and with a front three of Leo Messi, Luis Suarez and Philippe Coutinho lining up against them, the United manager opted for a back five which switched to a four when in attack. Yet United still held ambitions of making their own mark and not simply trying to stop their visitors from scoring. Marcus Rashford, deemed fit following an ankle injury, partnered Romelu Lukaku up front providing pace and power with Paul Pogba supporting from behind. Scott McTominay performed admirably in his second consecutive Champions League start having played away at Paris Saint-Germain. Barcelona are more conservative under the management of Valverde but hardly less effective. The metronomic Ivan Rakitic, Jordi Alba and Arthur all individually completed more passes than the entire Untied team. And as anticipated, United’s concentration was profoundly tested in the early stages as Barcelona passed the ball but without probing. But relentless passing eventually bore fruit on 12 minutes when an uncharacteristically poor touch by Messi took the ball wide of penalty spot. Still in control though, he deftly chipped to the back post without even a glance finding the head of Suarez whose header across goal took a slight deflection off the shoulder of Luke Shaw and into the net. At first, the goal was ruled out by the linesman on the far touchline for what one presumes offside. However as Old Trafford began to breathe a sigh of relief the VAR awarded the goal, having spotted that the final touch was off Shaw and not the diving Coutinho, thus being an own goal. 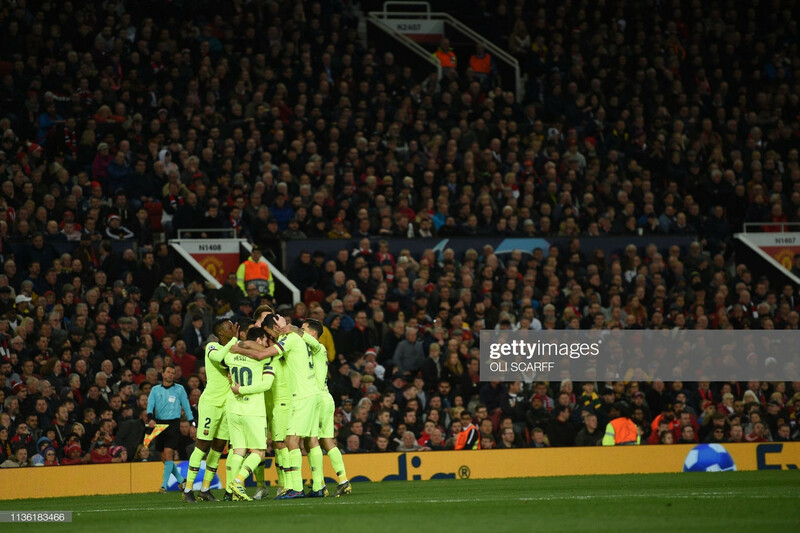 The visitors kept with their unremitting possession and when Shaw was booked for hauling down Messi in a cynical act, which suspends him from the second-leg, the anxiety manifesting amongst the United players was evident. The hosts were left with trying to get the best from free-kicks but Rashford, Pogba and Fred all misfired. If Barcelona had initially bloodied the nose of United, then Chris Smalling certainly lived up to his bold pre-match statement of “bring it on!” by strongly going through the back of Messi and bloodying his. It was forceful and should have led to a yellow card. As should have McTominay’s dive in the Barcelona penalty area, there was minimal contact from Gerard Pique but the theatrics exaggerated to say the least. As half time approached, both teams went close to scoring. Firstly, David De Gea had to demonstrate his superb reflexes by saving with his feet. Coutinho’s shot came as a result of great hold up play by Suarez who had been played in by Victor Lindelof’s skewed clearance. Then, with Marc-Andre ter Stegen nowhere to be seen, Diogo Dalot could only head wide despite being free of the company of any Barcelona defenders. His attempt should have at least been on target but nevertheless it, along with United’s growing assertion, offered the home supporters encouragement. Preventing Barcelona from scoring a second away goal was always going to be the priority for United in the second half, but then travelling to Barcelona would be much more palatable with a goal of their own. As the visitors emerged from the break rather sluggishly, United fancied their chances of scoring only their second home Champions League goal this season with every passing minute. A remarkable stat considering they are in the quarter finals. Rashford sliced a shot wide then shortly after was unable to control a defence splitting pass from Fred in a decent position. Meanwhile at the back, United’s defence had switched to a three, and were proving adept at keeping Barcelona’s attacking trio at bay. But when Suarez struck the side netting and Messi’s deflected free-kick needed a save from De Gea, it was a reminder of the threat that they possess. Solskjaer opted to bring on Anthony Martial and Jesse Lingard hoping that their added pace and trickery would unlock the door to a vital first-leg goal with 15 minutes left to play. The final exchanges were dominated by United’s search but the chances never came, Ter Stegen was hardly called into action. United have plenty to overcome in Barcelona. There was only one goal and not too many more clear chances which either team mustered. United didn’t manage a shot on target and those off target mainly came from free-kicks. Lukaku worked hard but saw little of the ball in promising positions, when Lingard and Martial came on they also struggled to conjure goalscoring opportunities. Barcelona, on the other hand, created more than their hosts and deserved the win but baring Suarez’s shot at the side netting and De Gea’s fantastic save to deny Coutinho, they were happy to keep possession and not overly try to double their single-goal advantage. This is how the current Barcelona perform, rather unspectacularly with some spectacular moments but yet still rather effectively. They dominated the ball, to ridiculous amounts at times during the match, but were content deploying their pass and move approach without testing United’s defence too heavily. Credit must be given to United’s defence who altered their shape numerous times throughout the evening and were able to withstand the threat that Messi, Suarez and Coutinho showed in glimses. That said, Barcelona will be considered favourites to progress and with an away goal, they will be confident in the task at hand.